Half a year ago, I read about Multi-Masking, a technique that famed NY facialist Joanna Vargas specialises in. Let's just say it's nothing new that hasn't been floating around for years,(highlighting - strobing, anyone?) and companies have already marketed kits towards this. If you like me have different types of skin on various areas of your skin - multi-masking is key for this. I slowly started to incorporate this into my routine to try get the best out of my at home facials. I have combination skin so using a clay mask all over doesn't utilize my skin's needs. Joanna uses 3 face masks to target the t-zone / cheekbones & crows feet / chin & jawline. I think you need to asses your own skins needs, where do you break out more, more dry oily and customise your needs. Obviously you don't need to use just masks. You can use pore strips and/or eye masks. My skin type is combination, I have a oily t-zone, pigmentation normally on the cheeks and I break out by my chin, jawline and sometimes cheeks. The masks are determined by the current need. Target (t-zone) : Origins Clear Improvement. Target (cheeks) : Sanctuary Spa 30 Day Youth Glycolic Peel x Mario Badescu Whitening Mask. Soothe & Calm (jawline x chin) : Sanctuary 5min Thermal Detox Mask x Manuka Honey. 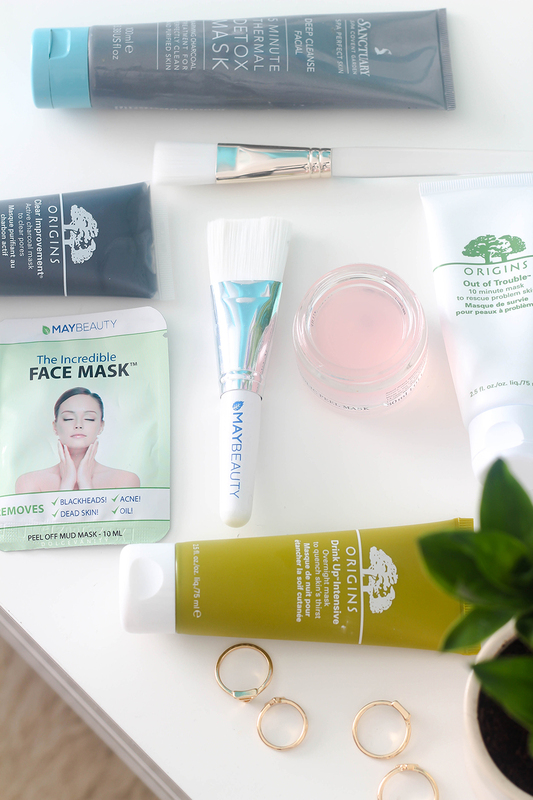 Soothe & Calm : First Aid Beauty Ultra Repair Instant Oatmeal Mask. Soothe & Calm : Origins Out of Trouble. Some of these products may have been sent to me for review. For more information, see my disclaimer. Looks really like a wonderful product!thank you for sharing.. It's true it has been around for a very long time from what I noticed but I never gave it much thought. I use to do two separate face masks one after the other. Now a thing they're calling "Stacking". It's just like this whole strobing / highlighting fiasco it's something that's been given a lot more spotlight. Thank you for reading. Have a good week too!